It's not an illusion. It's your own eyelashes -- only better ! Latisse makes lash growth possible because if it's active ingredient --brimatoprost. Although the exact mechanism of action is not fully known, research suggests that Latisse increases the hair growth phase. 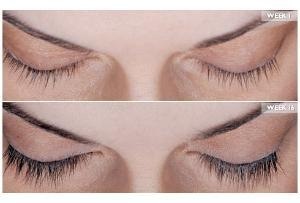 Latisse is easy to use ! It is once a day application to the base of the upper eyelashes with a small brush. Results were noted by 4 weeks and complete at week 16. While Latisse is a new treatment for eyelash growth, it was developed through years of research by Allergan, a leader in the ocular pharmaceutical world with more than 60 years of experience in eye care products.